Centred around a kit with 2 kicks and 3 toms full of classic maple warmth and sustain, BFD Jazz Maple also includes a bonus reduced-detail snare (taken from BFD Signature Snares Vol.1) and Sabian cymbals (from BFD Jazz & Funk Collection) which are recorded in similar studio conditions. Although the included kit's tone is particularly suited to jazz, fusion and funk, it's great for any other musical styles that need expressive and great-sounding drums. 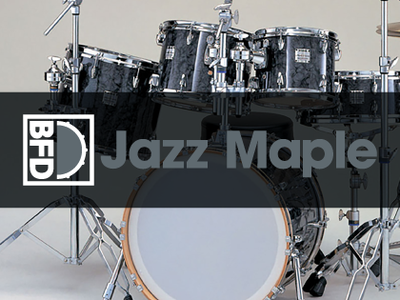 BFD Jazz Maple comes complete with a set of 5 Groove palettes from Platinum Samples' Real Jazz MIDI collection.